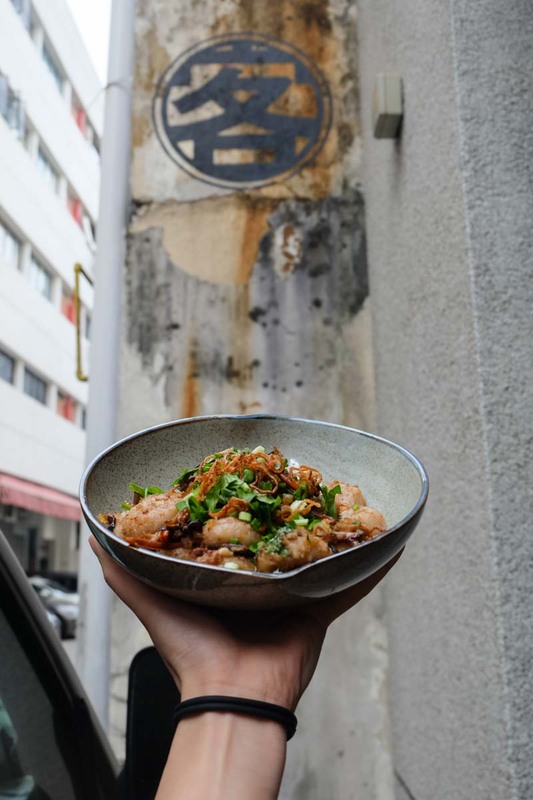 If you happened to walk past the back alley of Penhas Road the past year, you might have caught the aroma of Hakka Food wafting from Pang’s Hakka Delicacies. Opened in February 2018, this place occupies the space behind the renowned pastry cafe, Antoinette. The store location is not coincidental as both Antoinette and Pang’s Hakka Delicacies are helmed by the same person, Chef Pang Kok Keong. 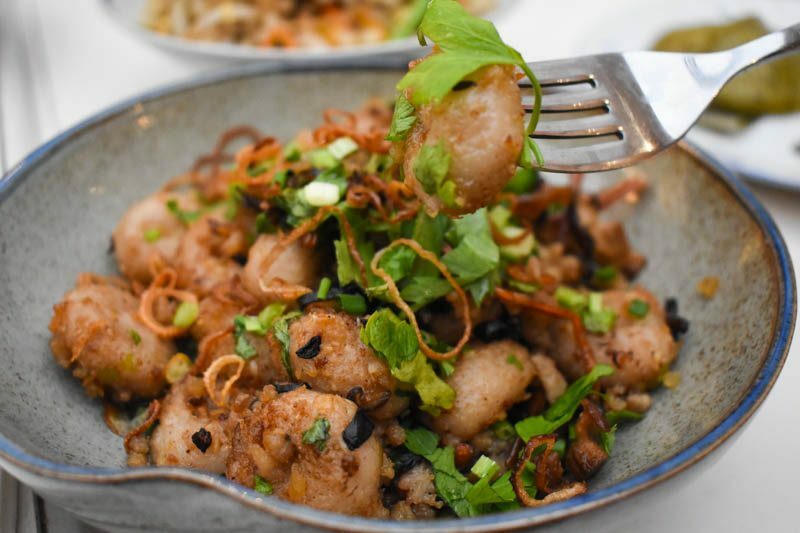 After an extensive 20 years as a French cuisine chef, Chef Pang has made the bold transition to serving Hakka food. He mentioned that the Hakkas are rare minorities that are gradually diminishing, hence preserving and honouring his roots were the main reasons for setting up Pang’s Hakka Delicacies. 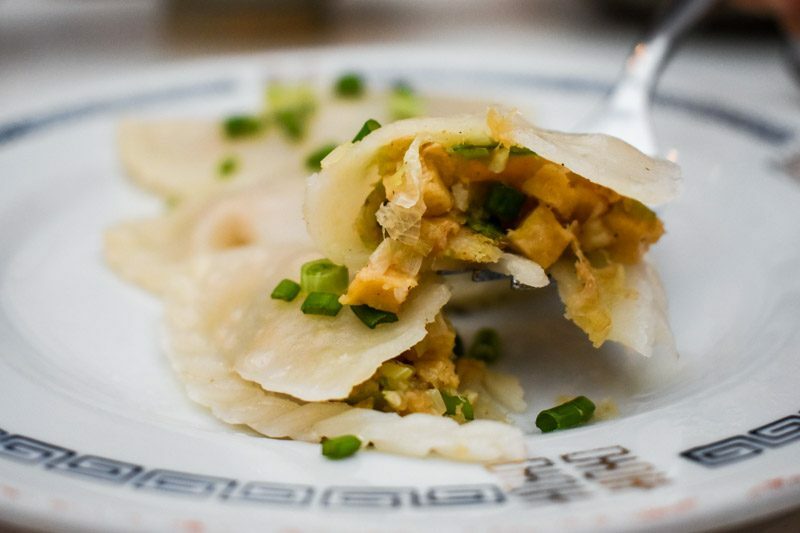 What’s interesting is that Pang’s Hakka Delicacies does not actually have a dine-in area. When inquired, Chef Pang explained that he does have plans to expand the business. However, it is still a work in progress as Hakka food is labour intensive and there is a lack of demand. So for now, Pang’s Hakka Delicacies operates through WhatsApp where customers place their orders one day in advance before the collection date. After talking to Chef Pang, I was excited to try the food! I started my meal with the signature Traditional Hakka Abacus Seed (客家算盘子) (S$8 for 250g). It is one of my favourite Hakka dishes and Chef Pang’s abacus seed was one of the best I have ever eaten. Every bite of the chewy and firm abacus seeds made me crave for more. Chef Pang’s abacus seeds were chewier than those you’ll find elsewhere due to the presence of more yam. The strong usage of fried shrimp, shallots and mushroom gave this dish its strong aroma. This dish was truly a masterpiece! Moving on to the next dish, we had the Hakka Leek Kueh (客家算粄) (S$12 for 6 pieces). Despite having similar looks to soon kueh, it actually has very different ingredients. 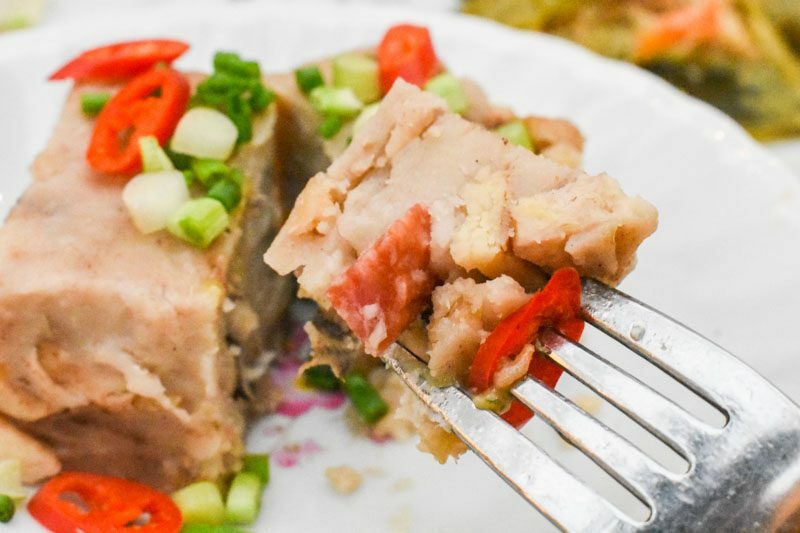 Unlike its Teochew counterpart, Hakka leek kueh is made up of minced leeks, dried shrimps and tau kwa (fried bean curd) without any turnips. This dish evokes nostalgia in Chef Pang as his mother used to make this for him when he was a child. Using his fond memories, he tried to replicate the taste of the dish to match that of his mother’s. Hakka Leek kueh has a stronger taste than soon kueh; every bite was filled with the fragrance of fried shrimp and leeks, while the tau kwa provided an interesting texture. Chef Pang recommends having this dish currently as leeks are in season which makes them more fragrant than usual. Next up, we were served Hakka Mugwort Kueh (客家艾草粄) (S$9 for 3 pieces). For those who are unfamiliar, mugwort is a commonly used herb in Hakka culinary even though they are very rare in Singapore. 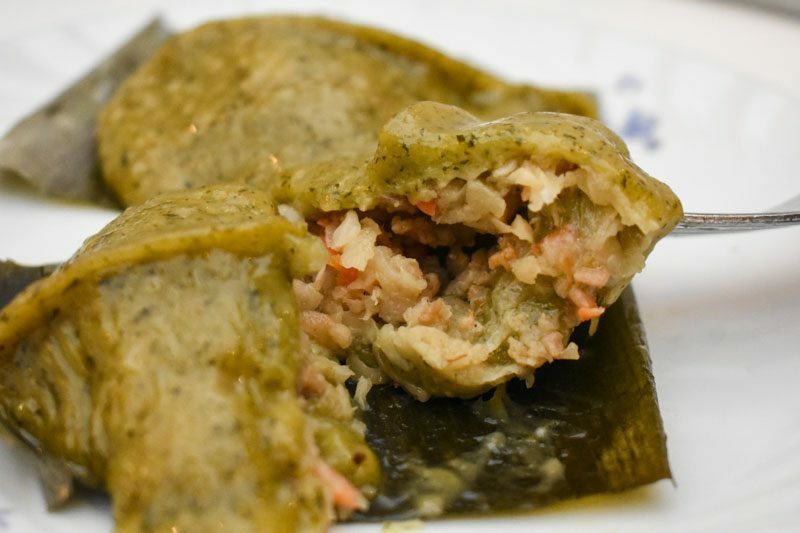 It contains a plethora of fillings, such as white radish, salted turnip, sweet turnip, carrot, minced pork, garlic, dried shrimp, mushroom and fried shallots. I was told by Chef Pang that mugwort has a slight bitter profile. However, his version did not have a hint of bitterness at all. Instead, I tasted the piquant aroma of shrimp, minced pork and garlic. 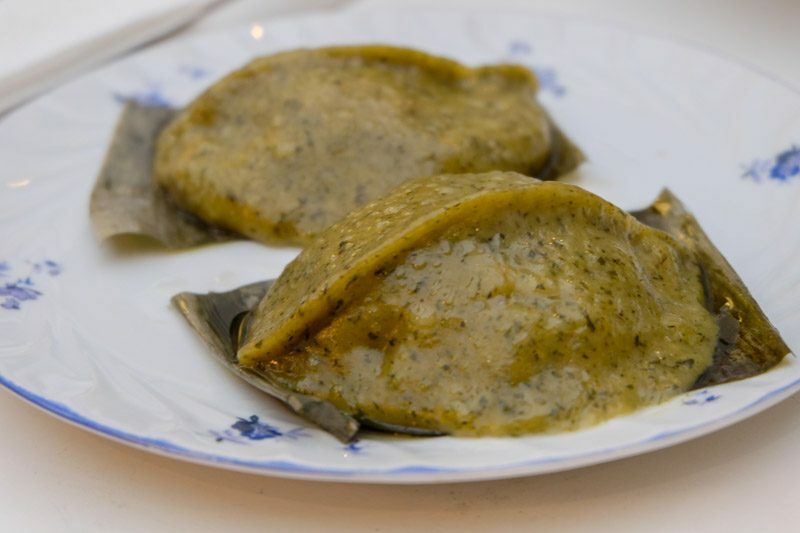 The mugwort kueh skin had a QQ texture and it was a joy chewing on it. You’ll want to order this! A new addition to the menu was the Hakka Mee Tai Mak (客家老鼠粉) (S$6 for 250g). The first things I noticed about the noodles were their thinness and had a greater opacity than those found in the market. Chef Pang attributed the difference to the higher usage of rice flour and starch. The handmade noodles were al dente and every strand was flavoured with the sole fish powder. The shrimp and mushroom made the dish more substantial. 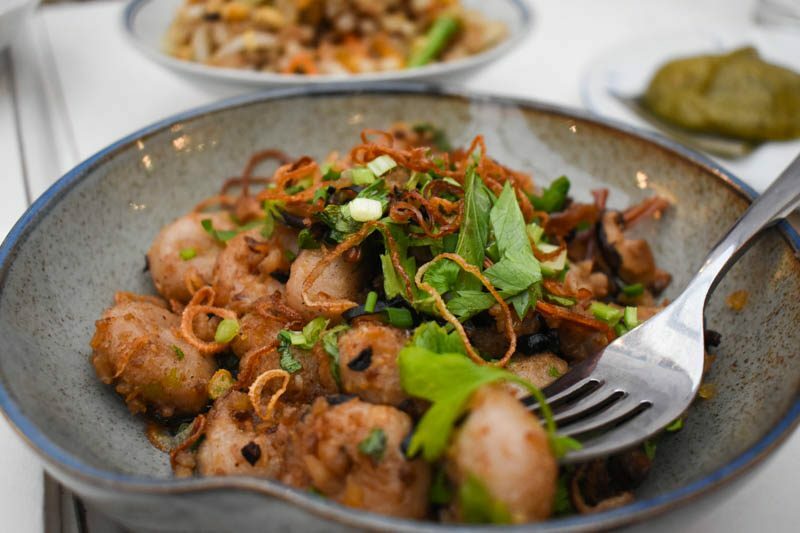 Chef Pang told us that traditional Hakka yam cakes usually do not contain luxury ingredients. 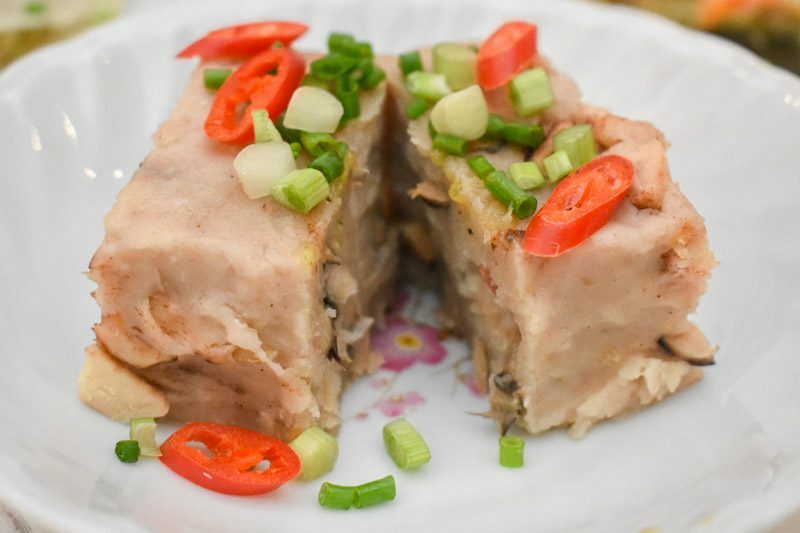 However, his version of Hakka Yam Cake (客家芋头糕) (S$8) boasts a generous usage of mushroom and sausages. Fried with lard, I could immediately tell the difference on the first bite. The usual yam cakes usually taste bland and required chilli sauce to boost their flavours. Chef Pang’s version was delicious just eating it plain. Though a little sinful, it was definitely worth the extra calories. For desserts, we had the Hakka Muah Chee (客家黑糖鴛鴦麻糬) (S$15 for 800g). It came in two contrasting colours: the paler colour was layered with caster sugar, roasted peanuts and white sesame. 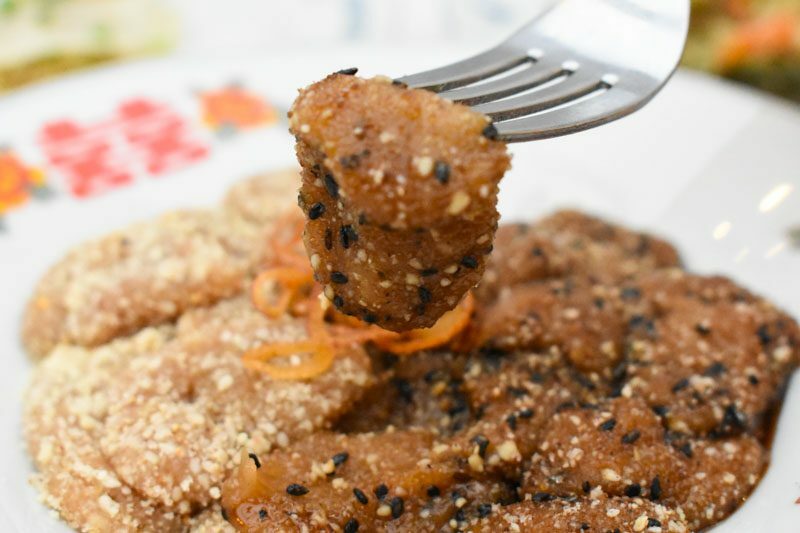 Its darker version contained black sugar and was roasted with black sesame seeds. 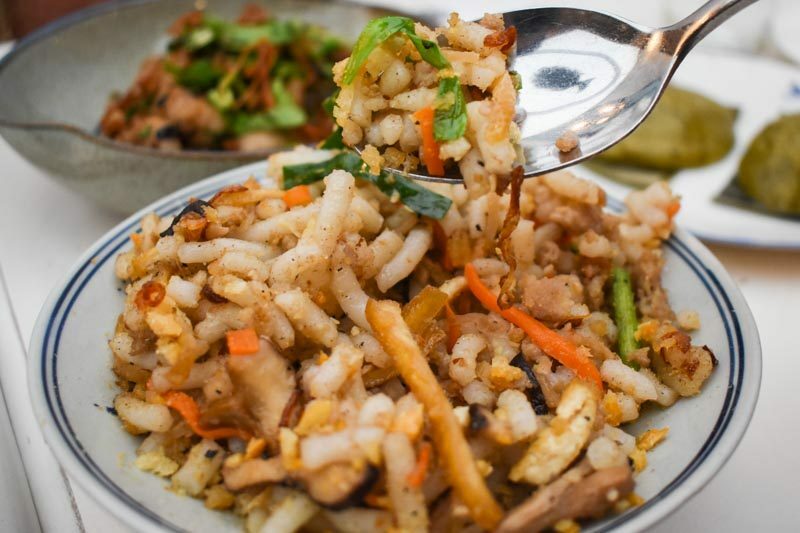 Chef Pang shared that Hakka muah chee is usually plain. His version spotted more flavour by frying them with shallots. Comparatively, I preferred the darker version more as I enjoyed the stronger taste of black sesame. Though the muah chee taste was not bad, it could use more springiness. Out of the Hakka cuisines I have tried out there, Chef Pang’s is hands down one of the best. I would definitely come back just for his Hakka Abacus Seed and Hakka Yam Cake! It is a pity that there is no actual dine-in area which makes it more hidden to the public. While the prices are not exactly cheap, I feel that they are still worth paying for. 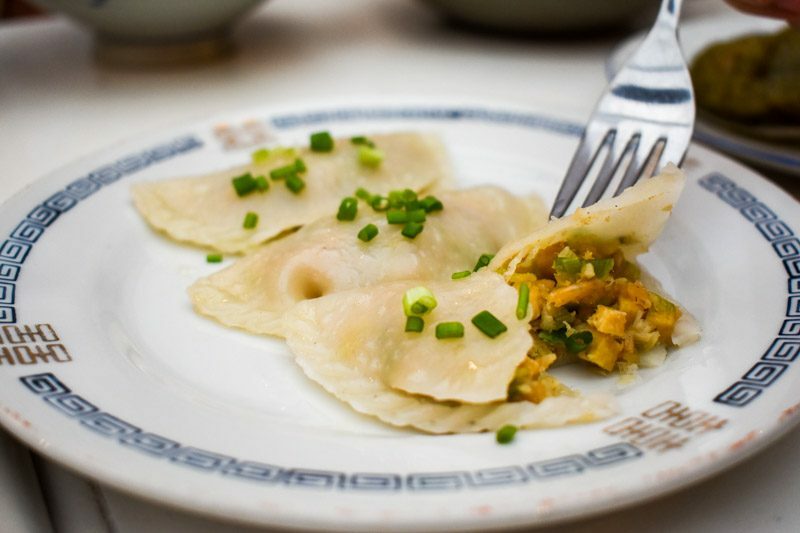 If you are seeking some authentic Hakka food, do give Pang’s Hakka Delicacies a shot! But remember to place your orders through WhatsApp (+65 9021 7507) one day in advance before the collection date.